SUU Department of Music’s Satellite Salon Series hosts Wave Trio in a concert titled Jazz Horizons. This first concert in the Satellite Salon Series for the 2018-2019 school year will be held on Saturday, September 15, 2018 at 7:30 p.m. in the Thorley Recital Hall. Jazz Horizons is free and open to the public. 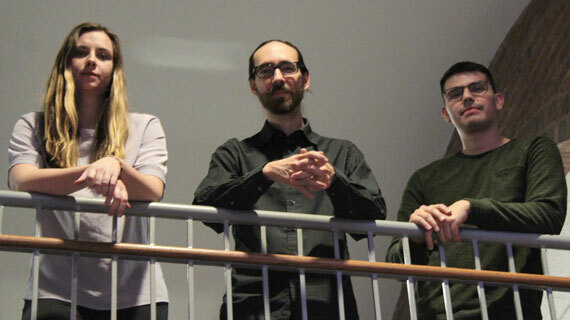 Wave Trio consists of members Chris Reyman (piano), Jonathan Rodriguez (drums), and Emma Taylor (bass/vocals). Firmly rooted in the tradition of American jazz, Wave Trio plays influential jazz trios from the “Great American Songbook”. Additionally, their original compositions extend the limits of harmony, rhythm and form within this type of group. They challenge the roles and forms of jazz trios with imagination and courage, in both obvious and subtle ways. Their music creates an intensified communication of progressive jazz with a fascinating and airy openness, collaborative camaraderie, and virtuosic interaction. Created by Dr. Lynn Vartan, the Satellite Salon Series occurs twice a year and provides Southern Utah University and local students an opportunity to attend master classes held by professional musicians. A question and answer session follows, led by SUU faculty member, Dr. Vartan, in the style of “Inside the Actor’s Studio”. Saturday evening offers the community and students alike a chance to see a dynamic, collaborative Satellite Salon concert. The Series is also an educational program, designed to give southern Utah rural high school students the opportunity to learn from professional musicians and artists. Dr. Chris Reyman joined UTEP’s Music Department as an Assistant Professor of Commercial Piano in 2014. He received his Bachelor of Music in Commercial Music from Millikin University in Decatur, Illinois and his Master of Music and Doctor of Musical Arts in Jazz Performance from the University of Illinois Urbana-Champaign. He has performed and given presentations nationally and internationally and is a well-respected member of the professional music education community. Jonathan Rodriguez is an emerging percussionist. He received his Bachelor's degree at Millikin University in Latin American Studies and Percussion Performance and holds a Master's degree, also in Percussion Performance, from the University of New Mexico. He has won numerous awards at competitions for performance and scholarship and has taught percussion lessons throughout various schools and institutions across the country. Emma Taylor is a rising bass player from Central Illinois having graduated from Millikin University with degrees in Music Business and Commercial Music. Emma has been immersed in the cultural arts since birth and grew up performing from a young age. She attributes her musicality to years of studying dance. Emma has won numerous scholarships and awards for her playing and has toured internationally playing in Cuba, Argentina, Chile as well as in the United States. Connect to songs of the “Great American Songbook” through the jazz renditions of Wave Trio. For more information, please visit www.suu.edu/pva/music.